Everyone knows what goals are, but most don’t know how or even why you should be setting them for your business. Goals are a great way to keep you on track. Keep you motivated, but most importantly, goals make sure that we have a sense of direction. All the determination and motivation in the world won’t get you very far if you don’t have a clear vision of where you’re headed. By setting smarter goals you are essentially writing your own road map to success. Not to mention you’ll have a far greater chance of crushing them! Here are some key points to follow to make sure you are getting the most out of your goals to move your business forward. Focus is key. You want to use your goals as a guiding light to the main priorities in your business. Hone in on those key components that will really move your biz forward. Then get specific about it! Define exactly what you want to accomplish and exactly how you intend to do so. Your goals should never be left open ended, with you scratching your head how you will ever obtain them. The ‘how’ and the ‘why’ should be written right into your goal to set you up for success! After all, without an intended direction you’ll just be left wandering. In order to know if you’re on the right track or even half way there, goals should have definite values. Whether that be an exact dollar amount, number of clients or a percentage you’re wanting to reach. Vague goals like ‘make a lot more money’ ‘be successful’ or ‘get more clients’ will result in just as vague results. By having an exact point of reaching your goal defined you will be able to better track your progress, celebrate those steps towards victory and ultimately be more likely to achieve that desired end result. You will be able to track if you are staying on schedule and be more consistent with your weekly (and daily) efforts when you have solid numbers to go by! Consistency is key. What good is a goal that you can’t take action on? How do you do this? By making one that can be easily broken down into smaller, manageable chunks. These are the ones that will lead to success! Every solid business goal should have clear and concise actions that will help get you there. If you are wanting to build you social media following by X many followers, build in that how with it. “By…doing x, y and z”. These are the actionable steps that you can then map out backwards. So you know exactly what you have to do each week or each month in order to stay on track to success. This will get you to not only achieve your set goal, but will have you crushing it. A good goal is something you can achieve, but a great goal is one that makes you push extra hard in order to achieve it. You want to find that happy middle ground in between being realistic but still reaching. Anything that is too easy to obtain will not leave you feeling accomplished but instead complacent. And one that is too far out there is just setting yourself up for failure. So think BIG and push just a little outside of your comfort zone. You can do it! And most importantly at each milestone and little victory along the way be sure to celebrate. You earned it. Time frames are so important when it comes to goal setting. Making sure to set real deadlines keeps us not only accountable but staying in motion. Adding this defined structure to your goals makes sure you avoid open ended milestones that just end up collecting dust and put on hold- for eternity. You want to pick a time that is short enough to keep up your momentum and excitement, but one long enough to give you enough space to actually do the work to achieve it. If you have a big long term goal, try picking out the halfway point to that desired result and making that your focus first. With a finish line that’s within the foreseeable future, you’re more likely to see results and stay motivated to keep going. Like most things in business, we want to work smarter, not harder. That’s why learning how to set proper goals for not only you biz but your life is such a great tool to have. It gives us that drive, motivation and structure that we need to move everything forward in the most efficient and quickest way possible! We’re all too familiar with the New Year’s resolutions (you know, the ones everyone has abandoned by week five) but by implementing strong goal setting into your quarterly, monthly, even weekly habits is a sure way to lead to success. Brittany May is a business owner turned business coach for women entrepreneurs. After the trials, tribulations and success of running her own million dollar business she was left feeling stressed, overwhelmed and burnt out. Through a shift in priorities (thanks to becoming a mom!) she realized the importance of working smarter not harder. So she streamlined her retail business from a chain of brick and mortar locations to solely online. Giving her the ability to work from anywhere and be in control of her schedule again. Now she helps other women follow their passions and build wildly successful businesses, all while living a life they love! In early 2018 Facebook announced their biggest update to the Facebook algorithm, yet the message was clear — you must use Facebook Live. Facebook Live can be a powerful way to grow your presence on Facebook, but you must know how to optimize your Facebook Live to maximize your reach and engagement. In this blog post I am going to review with you the exact Facebook Live system that I use to get tens of thousands of viewers on Facebook Live. You can practice going live on your personal page by setting your post to “Only Me” then going live. For business purposes, the best Facebook Live topics educate, entertain, and empower. A best practice for Facebook Live would be to choose a regularly scheduled time that you go live. However, if you are not ready for that yet, make sure to promote your Facebook Live at least a week ahead of time by setting up a calendar event, posting about your Live, inviting your followers to RSVP, sending an email to your email list, etc. Your Live will feel more natural to you and your audience if you just make an outline of bullet points you want to cover vs. a script. Make sure your post have an attention-grabbing caption that will stop the scroll. Address WHO this Live is for, WHAT you will cover and HOW to get more information (links, etc.). Pretend you are talking to your best friend while you are live. Going live can be intimidating so try to relax, smile and have fun! Facebook will favor your Live if you not only have interaction between you and your viewers but if there is interaction between your followers as well. Make sure to ask questions throughout your Live and encourage your viewers to help each other and connect in the comments. Phew! You went live, now what? Here’s a secret that you may not know – your post Facebook Live process is going to make or break whether your Live is effective or not. The majority of people who watch our Lives actually watch the replay. Here’s our process for making sure we get the most bang for our buck after our Facebook Live has ended. Even if you are not planning on advertising right now you’ll want to set up a custom audience in Facebook Ads of people that watched your Facebook Live broadcast. People who watch videos are a highly engaged audience that you can market and sell to later. Facebook has a serious sense of humor with some of those Facebook Live screen captures. You can change the screen capture by going to Publishing Tools > Video Library > click on the pencil to the left of the camera icon of the Live you want to change, select a new screen capture and save! Many people on Facebook will watch your video without the volume on. Take advantage of this behavior and add captions to your Facebook Live. Share your Facebook Live to other places you have a presence: your private Facebook Group, your personal page (only if it’s relevant), your blog, your website, etc. If after 24 hours or less you are seeing that your Facebook Live is performing well, consider putting a little money behind it to boost your exposure to your ideal client. Going Live on Facebook can be an intimidating process but it can be well worth your time investment to help build trust with your audience. Nina Simmons is an online marketing expert and digital strategist. As co-founder of NB&NS, a Phoenix-based, online education consultancy, her goal is to empower business owners and entrepreneurs to increase their presence, results and profitability online. Simmons has helped hundreds of multi-million-dollar businesses grow their brands and revenue. Past clients include billionaires, technology and medical device startups, luxury destinations, resorts and golf courses, golf equipment designers and various political initiatives. Before starting her own consultancy, Simmons served as a digital marketing director in the advertising agency world. You can follow Nina on her blog, Facebook and Instagram for more marketing strategies to grow your business online. Let’s not beat around the bush here. Social media flicks its flame into every part of our lives. Scrolling through your Instagram feed whenever a webpage doesn’t load immediately. Getting sucked into a Facebook Group conversation that takes up half your day. Watching a bunch of Instagram Stories as you sip your morning coffee. Posting your own content and then checking in every twenty minutes to see how it’s doing. I know, I know. I do it too sometimes. And I’m certainly not the first to say we’re no longer consuming content on social media - it’s consuming us. The “problem” of social media is not new news. In fact, I don’t believe social media is a “problem” at all. The problem here is, as ambitious entrepreneurs, our activity on social media can lead us to burnout faster than ever before. Oh dang, she just said the B word. Yes, burnout. 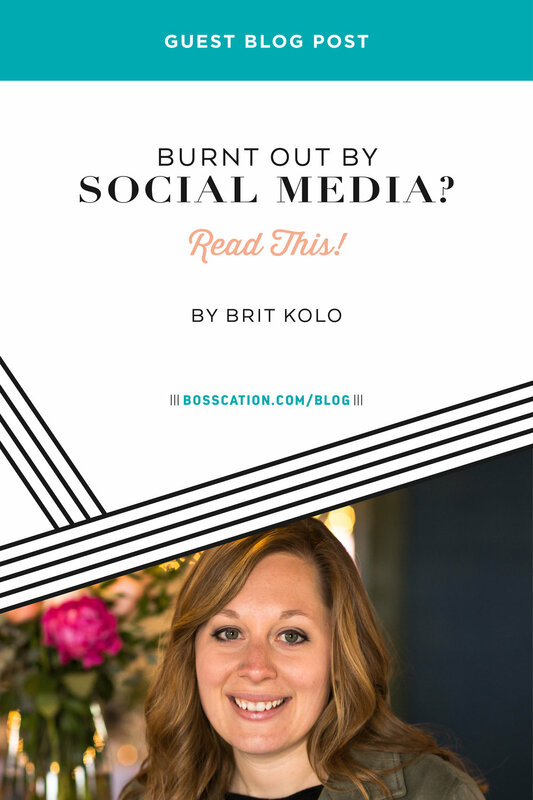 Social media fuels our journey to burnout in sneaky little ways, accumulating over time, guiding us right into the trap of waking up one morning and being totally convinced we can’t possibly do one more thing in our business without bursting into flames. But we can avoid this. That’s the good news. We can avoid burnout fueled by social media, first by understanding how it manages to wipe us out, and second by changing our perspective on social media as a whole. Our emotions are hijacked every few minutes by whatever we happen to see on social media as we scroll. As ambitious entrepreneurs, we then spend our already-limited time and energy creating content for social media that will *hopefully* get us more followers and engage our current audiences. Ahh and there it is. So as I mentioned earlier, we can avoid all of this. Not by just swearing off social media. That’s just not going to happen for more than a day or two at most. Instead, I propose shifting our perspective about social media to make it a more intentional, fulfilling place to be. First, do a “Joy Audit” on your current social media feeds. Take twenty minutes right now to scroll through the social media feeds you spend the most time in and unfollow any account that doesn’t immediate spark a sense of JOY in you. To take it a step further, schedule a 20-minute block to do a Joy Audit every month for the next few months so you can be sure you’re intentionally creating a joyful space for yourself whenever you do log in to social media. Second, embrace the fact that to GET engagement on your social media posts, you must GIVE engagement first. Chris Emmer of Sweaty Wisdom has termed this “Social Karma” and there’s no better name for it. What you throw out into the world is going to come right back your way. What you put into Instagram, you’ll get out. What you put into Facebook, you’ll get out. What you put into your email list, you’ll get out. So if you want if you want greater engagement – follows, likes, comments, AND QUALIFIED LEADS – you must first go GIVE that engagement to others. Comments are GOLD on Instagram. We know they boost our relevancy within the IG algorithm. So typically, the more comments we get on our posts, the faster our account grows. Want comments? Go spend time commenting on others’ posts. When other users click to your profile, DM you, or answer a poll from your Instagram Story, Instagram boosts your relevancy and shows your story to more people. Want people DM’ing you and answering your polls? Go watch others’ stories and begin conversations there. You want people to be more engaged in your Facebook Group? Go be engaged in others’ Facebook Groups. Again, it’s all about shifting your perspective on social media so it no longer leads to burnout. Intentionally create a joyful social media experience by completing a Joy Audit and then consciously embrace the concept of Social Karma by living it out. By giving first, receiving second. Now, the task is simple. I give you permission to go spend twenty minutes on Instagram - the first ten doing a Joy Audit and the second ten engaging with others’ posts. Comment below to let us know how those twenty minutes felt for you! Brit Kolo, Founder of JAM Marketing Group, is a Marketing Coach for creative, big-dreaming entrepreneurs, yearning for meaningful growth in their businesses. Through her intuitive, in-depth coaching process, she’s here to shake up your approach to marketing and inspire you to grow your business in a feel-good, meaningful way. When she’s not hopping on a Zoom call with a coaching client, she’s sipping chugging dark roast, podcasting in her yoga pants, and supporting her circle of fellow female entrepreneurs. I am in a pretty unique position in getting to see the insides of other people’s business before they are making money and after, since I have clients at both stages. Here’s something interesting I notice – when people are working to get that business going, they spend a lot of time working ON their business. Envisioning the future, creating programs, trying new things in their marketing – and trying new things in general. Once people hit some success, I see many who get so focused on their client work that they literally don’t have time left over to work on their own businesses. They spent all their time working IN, none working ON. I think this can come from a lot of causes: a mindset of not truly believing that they will have a full client load one day, a lack of setting up the business model with limits on time, poor time management, poor pricing so that you have to overcommit to make your income goal, and probably more. The one thing that is always true is that it proves toxic and sometimes deadly for solopreneurs! 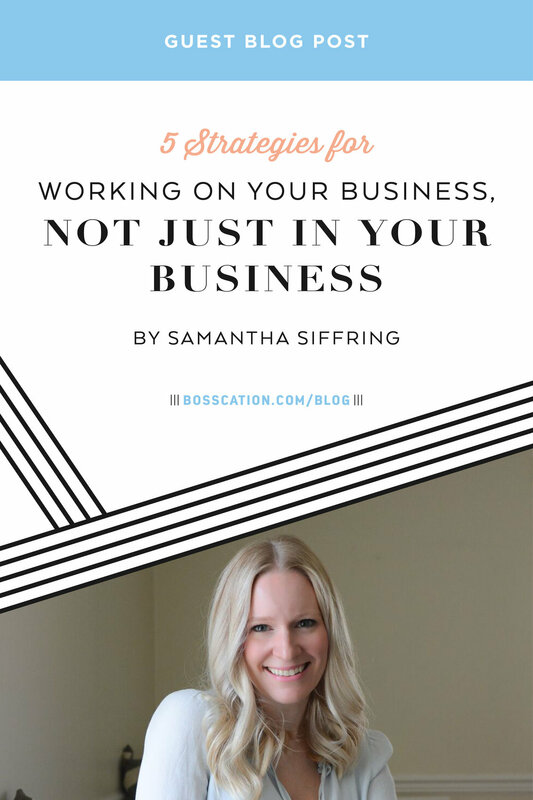 If you’ve spent a period of time only working in your business on client work and never on your business streamlining, scaling, and setting up systems, when those clients go away, you’ll be left with nothing. No income, no waiting list, no pipeline of leads. You’ll have to start over again completely from scratch. Here are a few strategies that will help you prevent this from happening to you…or recover after making this mistake! One of the messages I hear from every single internet millionaire is that they waited too long to bring someone onto their team. Growing a team, even hiring a virtual assistant for a couple hours a week at first, can free up your time to focus entirely on the income-producing activities while they do some of the behind-the-scenes work. Tip: don’t just focus on the additional cost, think about the potential revenue increase you will see when you’ve freed up more time for your zone of genius. If you’re not yet at the stage of building a team, at the very least, add your own business to your list of clients. Seeing your business on the list will be a good reminder of where to focus your attention and to not let it slip by unnoticed. Tip: flip this around and evaluate your performance as if you'd hired you to grow your own business. Would you be happy with what you have done? When we get so many clients that we don’t have time for our own businesses, it can be a sign that our rates are too low. If you haven’t re-evaluated and raised your rates in awhile, it’s time. Tip: there is no right or wrong way to raise rates when you currently have clients. You can keep your existing clients at their current rate, or let them know rates will be going up on a certain date. Do you have a lot of experience being an employee and very little as a CEO? Are you hesitant to own the fact that you are a CEO or an entrepreneur? Our self doubt in this area can be manifested in not showing up as the CEO in our business. Someone has to do it, and spoiler alert – no one else is going to show up to run your business. It has to be you. Tip: sit down and write a job description and expectations you have for yourself as a CEO (from the employee perspective) and as an employee (from the CEO perspective). Let’s face it: things don’t happen unless we schedule them in. Schedule in specific time to work ON your business and really step into your role as the CEO. This can be one day a week, one hour a day, or something else. Tip: treat this appointment in your calendar like any other. When we have appointments and commitments with ourselves, they seem optional or flexible. Treat your appointments with yourself like you would treat a doctor’s appointment — non-negotiable. Samantha Siffring owns tbhcoach.com where she is a business consultant and coach for moms with online businesses. She started as a coach after struggling to find her identity after becoming a mother and now is very passionate about helping other moms build businesses from home and balance entrepreneurship with motherhood. She is a mom of 3, an over-volunteer-er, and a travel lover – she and her husband met while studying abroad in college and are always taking their kids on epic adventures. You can find her on Facebook, Instagram or YouTube.